Asifabad District with Mandals: Asifabad has become a district again after three-quarters of a century bringing an interesting past, mostly connected with the rule of the Gond kings from Chandrapur, now in Maharashtra. As we all know that Telangana is a new state, so as Asifabad is one of the new district. Asifabad was an important part in the scheme of things of the Nizam of Hyderabad whose kingdom existed till Rajura, now part of Chandrapur district in Maharashtra. Komaram Bheem Asifabad district is a district in the Indian state of Telangana. It was a part of the Adilabad district prior to the reorganisation of districts in the state. In 1905, it was a district, which got merged into Adilabad district. In 1913, it was made as the district headquarters, before the status being lost to Adilabad in 1941. It is now renamed after the Gond martyr, Kumram Bheem. Still this district needs to be develop as it is a new one. As of 2011 Census of India, Asifabad has a population of 515,835. The district is spread over an area of 4,300.16 square kilometers (1,660.30 sq mi). Komaram Bheem is bounded by Maharashtra districts of Chandrapur district and Gadchiroli district on the northern and eastern side, on the south by Mancherial district and on the west by Adilabad district. This district is home to endangered species of Vultures which have made Palarapu rocks their abode in the forests of Bejjur. The Sirpur forest is also home to Tigers and other wild animals. Forest and greenery part is a lot more available here. So we can think of to have some fresh air and non-polluted air for ourselves in Asifabad. The district will have two revenue divisions of Asifabad and Kagaznagar and is sub-divided into 15 mandals. Population here in Asifabad is from various religion. As the native language of Asifabad is Telugu, Urdu, English and most of the village people speak Telugu, Urdu, and English. Asifabad people use Telugu, Urdu, English language for communication. So we can see that in this new district of Telangana people are from various religion and caste. So this is just awesome as people will be together and can know a lot about others religion and caste. 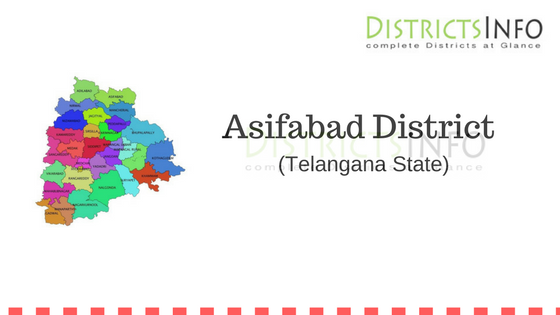 Asifabad is a new district with a potential to be a great district of Telangana State.